And no. Not my journalism. Apologies for the unnaturally long post. 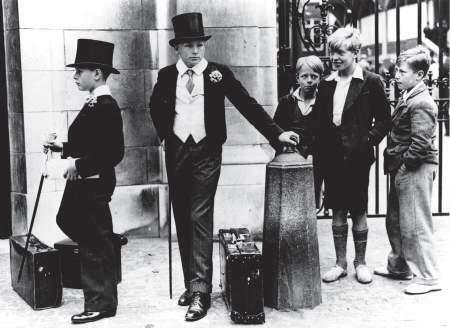 You’ve probably seen this picture before – in a newspaper story about what’s wrong with the British class system, your European History textbook, or someone’s blog. The Guardian undertook a follow up. But this time, rather than just indulging in nostalgia, a reporter managed to actually take a single image, and use it to break down our cultural assumptions about class and complicate the picture, rather than give a pithy sum up. I definitely usually stick to the brief of putting nothing that will take you more than about 2 minutes, and two brain cells, to consume up on this blog. But if you want to see why I still think journalists, and good journalism, are the heart of a functioning society, take some time to read a really good piece. Or, if that’s all a bit much: take a moment to consider the absurdity of Public School uniforms and then get caught off guard thinking suddenly and inexplicably about penguins, and then go find that really cute clip from Happy Feet of a penguin learning to dance, and then start considering what, really, is the cutest clip from any Pixar movie ever ever. And then, obviously, because it’s the only answer, settle on this one. No contest. And then spend the rest of the day looking at rescue dogs. It’s probably better for you. Except you should probably know that its totally embarrassing to dance along with the penguin in your library chair. I do. Now. After spending an inordinate amount of time lately with people who care deeply about this sort of thing, I’m slowly coming to understand the culture surrounding British Premier League Football (soccer! ), if not appreciate it. But this came as quite a shock to me. I had no idea that Premier League Christmas parties had such a long, colorful, and controversial history. So much for the stiff upper lip. The populace seems to think Top Gear is a reality show. Really, English? Really? You thought that was real life? You have been watching too much Big Brother (which, by the way, is STAGED). Go sit in your room and think about what you’ve done to your television programming. I love living in the UK for many, many reasons. Too many, in fact, to bother listing them. But the number one reason I love living in the UK is for the crazy news stories like this one. And the fact that there is a cheese shop in this nation named “Cheese Please”. Excuse me, I have to go watch some Wallace and Grommit now.